To extend our Mogao Grottoes experience we got to see a show related to the caves. 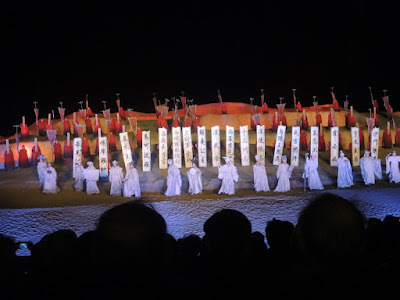 We didn't quite know what to expect, but then again, what else are you going to do in the evening in Dunhuang? 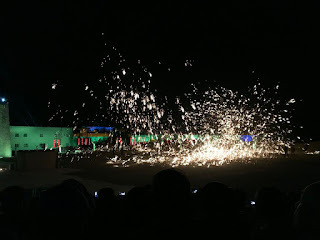 Our tour guide didn't know the show would be outside, so it did get a bit chilly, but given that an audience of several hundred were packed together, we were able to generate some body heat. The stands where the audience sat could move and it turned at right angles around four times to face four different stages. 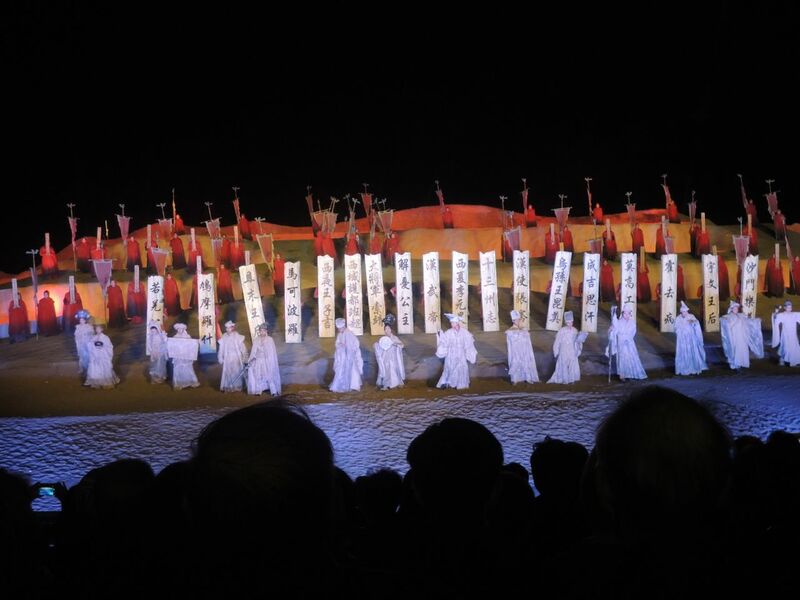 It's described as "luxury live desert theater", but how is it luxurious if you have to brave the natural elements? And the plastic seats aren't very comfortable... are we asking for too much? The story is about a painter called Mo Ding who works in Dunhuang, painting in the caves. It is highly dubious that he and a princess fall in love, but we suspend our doubts, because there's conflict in that she is betrothed to a warrior leader in order to have peace in the area. The smitten couple escape and hide for a while, but then the barbarian leader finds her and takes her back -- she apparently later dies of depression! In the end, Mo Ding continues his mission by expressing his love for her on the murals at Dunhuang. 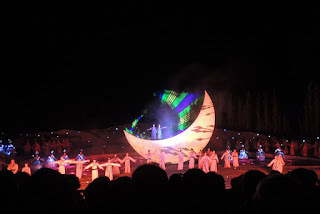 Some of the projections are pretty neat, creating a 3D effect, or at least adding another layer to the production, while other scenes, like in Dunhuang town dancing in the streets and couples standing by windows were irrelevant. 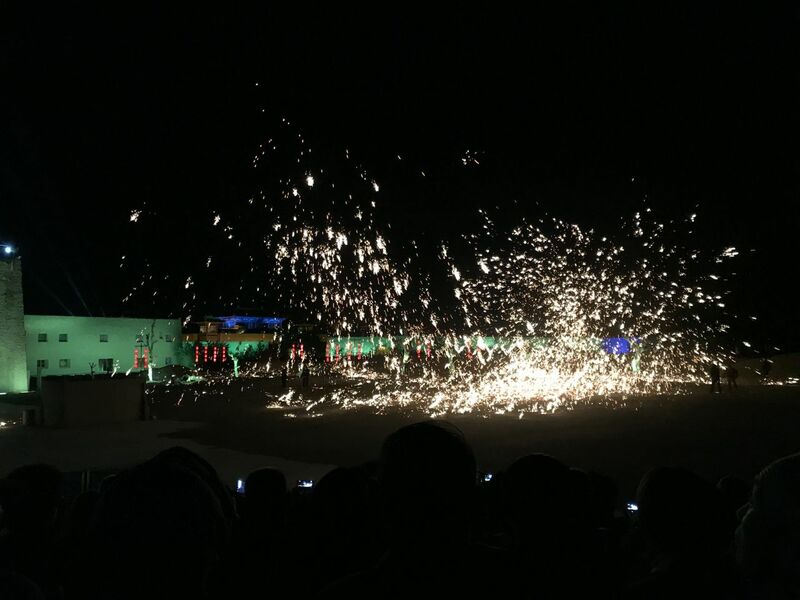 There were also some fire special effects used that again were not relevant to the story, but were there to keep the audience interested. Having just been to New York where the performers on Broadway are thrilled to be on stage, the dancers here looked at it as a job, some appeared bored, others managed a smile or two. The performers stood on or by the stage as the audience left, and a few elderly women pinched some of the young women's cheeks as if to check if they were real or not. Did the performers get this kind of treatment all the time? How bizarre!